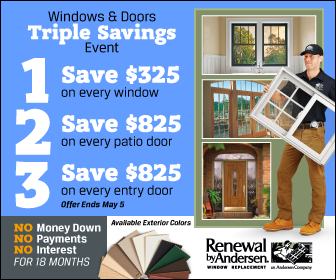 Since 1903, the team behind Renewal by Andersen® has been working hard to change the way the world looks at replacement windows and patio doors. Today, we are one of the most trusted names in the industry. Here are some of the reasons that you can trust us for your replacement window and door needs. You have a lovely patio. All you need now is the perfect patio doors. Renewal by Andersen’s products are meant to address such needs. We have the experience to provide the service that can make your vision a reality. Decades of practice have helped us to perfect our process, and we take pride in our relationship with our customers. Worried that ordinary doors are going to ruin the beauty of your new patio or that a hinged door will reduce the space devoted to your new patio furniture? Try our sliding patio doors. That’s the beauty of working with Renewal by Andersen. Whatever the need or application, you have options when you call us. We will work with you to come up with a product that matches your need, all without having to adjust the size of the door opening. Our made-to-order products are adjusted for the purpose. We build the doors that you’ve always wanted, and it also falls upon us to install them. There’s no need to worry that you’ll be working with an installation team that knows next to nothing about the door they’re putting in. Our products, our installation team equals to your advantage. In fact, such is our faith in our ability to see each project to completion that we offer industry-leading warranties on both the product and the workmanship. Work with us today for your replacement door and window needs. To know more about our services and products, including our French doors, call us for a free estimate and in-home consultation at (314) 332-2364. We serve St Louis, MO, and the surrounding areas.